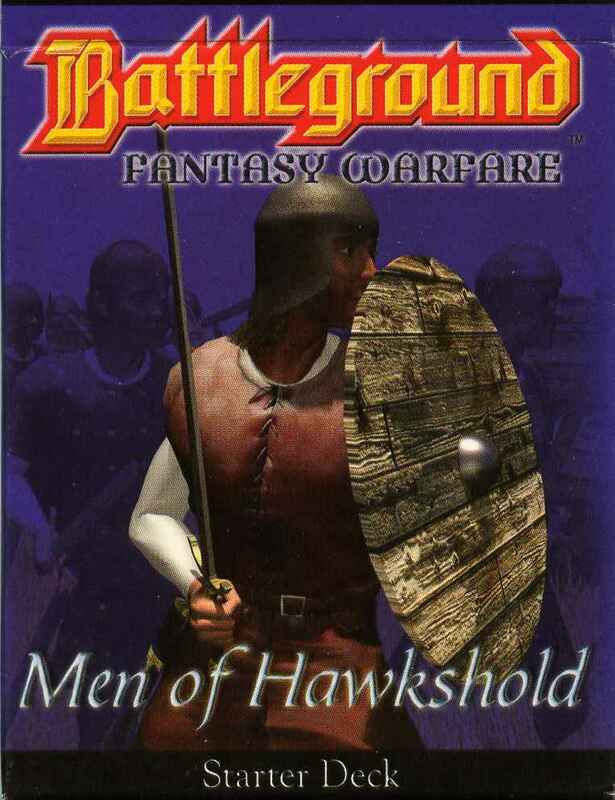 Back in 2005, Your Move Games came up with the idea of creating a tabletop miniatures wargame, without the miniatures: Battleground: Fantasy Warfare. The whole idea was to make the experience of miniature gaming more accessible by giving gamers armies to play without the ‘pain’ of actually collecting and painting miniatures. 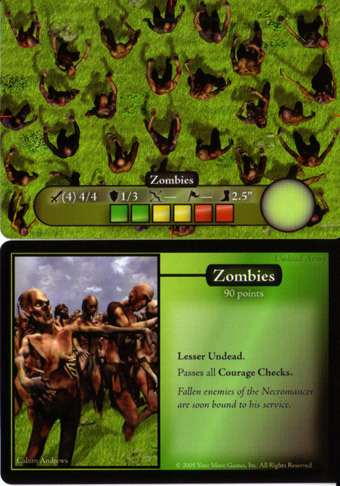 The game was designed with units being represented by cards with artwork depicting a top-down view of the troops in question. Originally, the game was designed with a Fantasy setting, and several armies were created, including Humans, Dwarves, Elves, Orcs, Undead and Lizardmen. 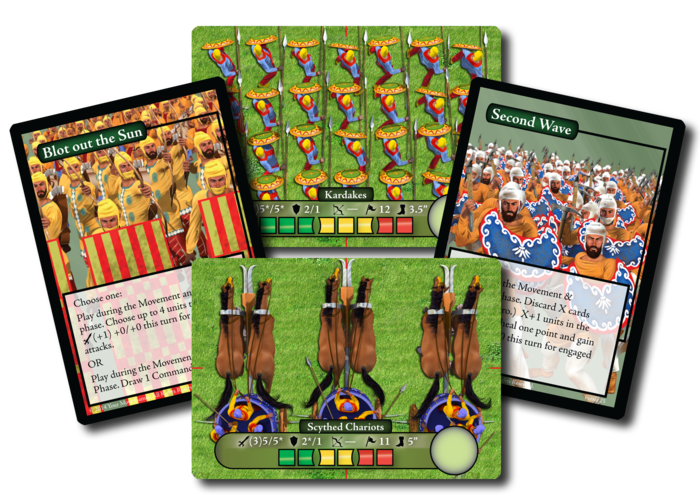 Each army consisted of two boxes of cards: the first contained the basic starter army, plus 30 command cards whilst the second contained a number of different units. Full rules for the game were provided within the game, but were also available to download from the website. They even released a terrain pack with the same artwork, to give the entire game the same look/feel. 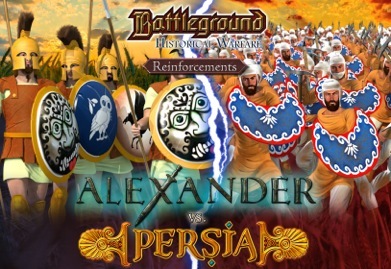 In 2009, YMG released an historical version of the game, Battleground: Historical Warfare. This time, the idea was to provide a set of two historically opposed armies, along with a list of scenarios to fight. The first of these titles covered the Punic Wars. Now Your Move Games are back with a new Kickstarter campaign for the second set of Battleground: Historical Warfare. 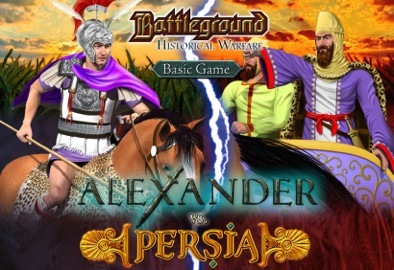 This new game covers the conflict between the armies of Macedonia, under the command of Alexander the Great, and the Persian Empire. The project was launched on the 20th May, and is already funded after only 2 days. It is due to run until the 20th June. Battleground: Historical Warfare contains a very good set of rules, and it is also a great way of getting into miniature wargaming for the first time without having to worry about the expense and time constraints of collecting and painting miniatures. 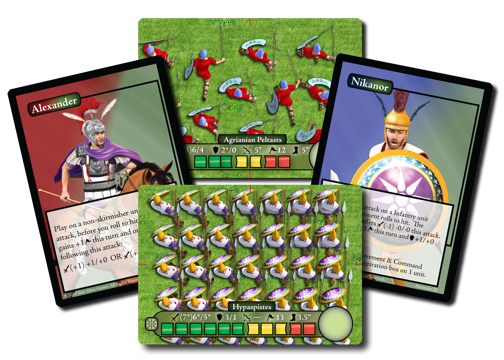 What is more, you should also be able to use the unit cards to play other element-based miniature wargames rules, such as Impetus or Hail Caesar, with very little extra work. BTW, If you want to know what I think of the game, I reviewed B:FW in episode 8 of the podcast, and B:HW in episode 53. Not a bad idea at all. Might be a good alternative to home made cut out paper units. People can then start playing and paint their army as they go, replacing a card at a time. “The whole idea was to make the experience of miniature gaming more accessible by giving gamers armies to play without the ‘pain’ of actually collecting and painting miniatures….” Does not compute. Sounds like going biking but substituting the bike with a strip of cardboard. (but then what the heck would I know about biking? 😀 ). Just kidding. Doesn’t sound too bad, I suppose and it’s kinda like the stuff I like to see funded on Kickstarter rather than Steampunkbikinigirl Renderfest (Zombie edition). Oh yes, I think I remember your reviews of the Battleground games. Weren’t Fantasy Flight involved with those games once or am I mixing battle-named games up there? Right, must have confuzzled those two. Ta, John.